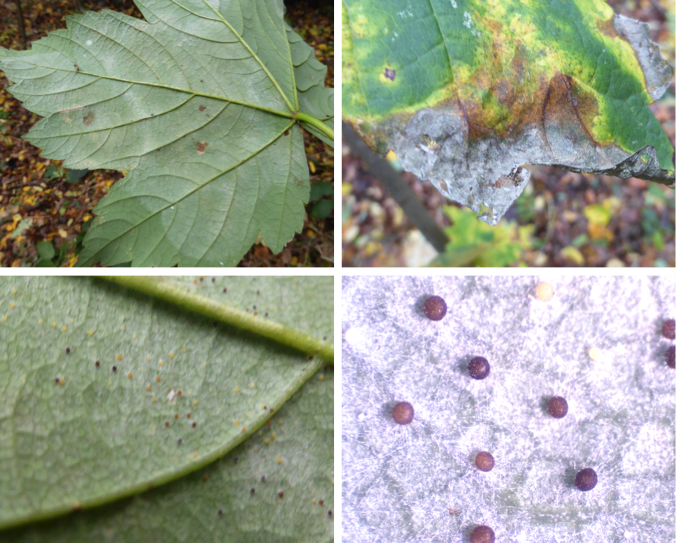 ← Powdery mildew phenology; it will be back! 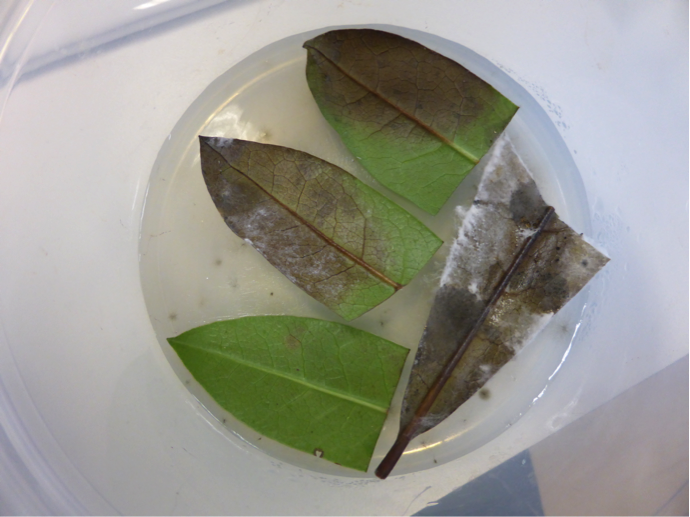 Winter is here and with it we have left behind my dear biotrophic fungus, the powdery mildew (PM). Figure 1: Evergreen Rhododendron sp. used for culturing PMs overwinter on water agar. Requiring plant material to source nutrients to grow and reproduce means that with the dropping of leaves, characteristic of ‘Fall’, PMs must survive the winter in a state of arrested development. Even evergreens, like Rhododendron (fig. 1), are relieved of the stress caused by PMs as the increasingly cold winter polishes them off. The fungus therefore survives these colder periods as spores, with resistant casings, biding their time on senescent leaves on orchard floors, trapped in tree crotches or in bark fissures (Medlin et al., 1998) and as mycelia within dormant buds (Rumbolz and Gubler, 2005). Early November saw the passing of my last PM of 2013 and, while I have plenty of stored specimens to keep me busy over this dark period, that Sawadaea bicornis, with its characteristic curled appendage tips, true-chains of conidia, ectoparasitic nature and plural asci chasmothecia, on the Sycamores (Acer pseudoplatanus) of the Reading University ‘Wilderness Area’ will sustain me till next year’s bloom. MEDLIN, L., ELWOOD, H. J., STICKEL, S. & SOGIN, M. L. 1988. The characterization of enzymatically amplified eukaryotic 16S-like rRNA-coding regions. Gene, 71, 491-499. RUMBOLZ, J. & GUBLER, W. D. 2005. Susceptibility of grapevine buds to infection by powdery mildew Erysiphe necator. Plant Pathology, 54, 535-548. This entry was posted in Uncategorized and tagged Acer pseudoplatanus, ascomycota, Erysiphales, Fungal Identification., fungi, Oli Ellingham, Pathology, Plant Pathology, Powdery Mildew, Rhododendron, RHS, Royal Horticultural Society, Sawadaea bicornis, Sycamore, Winter. Bookmark the permalink.